"Great crowd salad. Auntie Midge's recipe. Drain fruit several hours in colander before mixing with marshmallows." 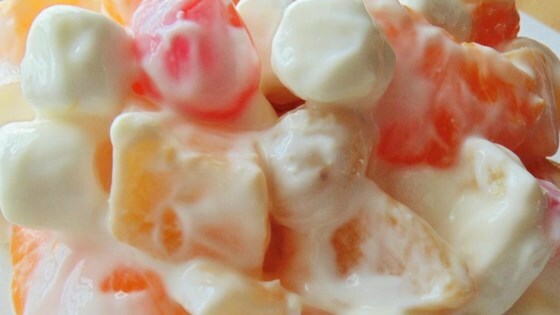 Mix fruit cocktail, pineapple, mandarin oranges, and marshmallows together in a large bowl; add sour cream and stir to coat fruit completely. Drain fruit several hours in colander before mixing with marshmallows. Added a small box of orange jello, without preparing, to sour cream and it's wonderful just like my Mom would make it when I was a child. Thank you so much for sharing! Wonderful salad. We thoroughly enjoyed it.